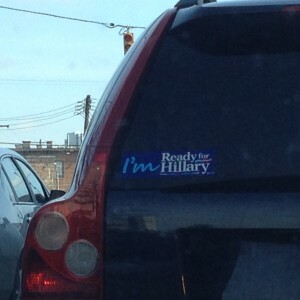 It’s much rarer to see a bumper sticker that captures a deeper truth. 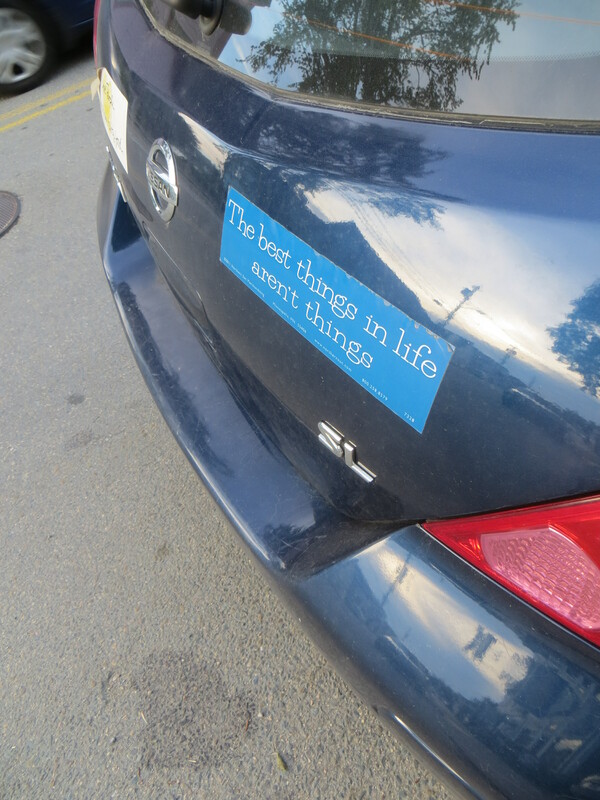 I thought that this bumper sticker, seen on a car parked in Mahone Bay, hit the nail on the head. I hereby confess to you all: I hate those “How Am I Driving?” bumper stickers that you see on so many commercial vehicles. Was there ever an emptier effort by a business to establish a positive civic profile? Has anyone ever actually called the number shown? I’ve got to believe you get a recording and a confusing set of different push-button options — if the number is even a real number in the first place. 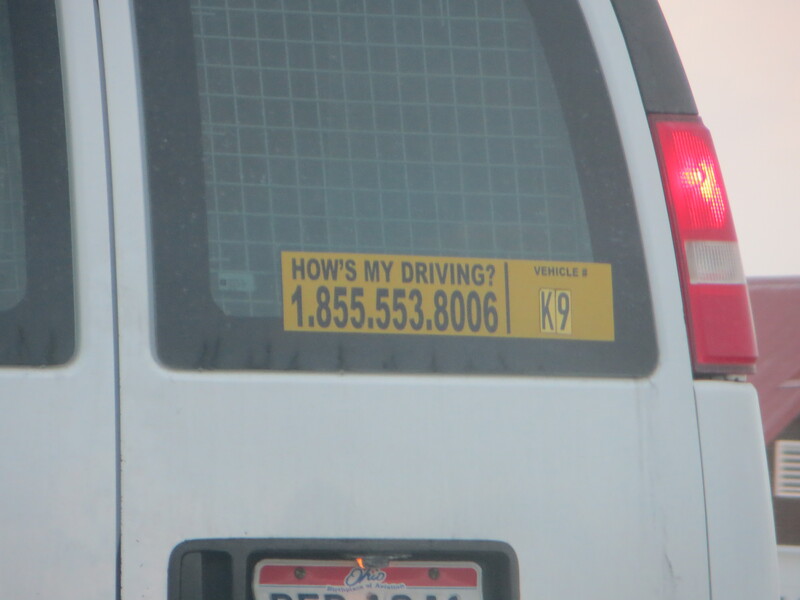 Are you supposed to call while you are driving, or are you supposed to somehow jot down the phone number while you are driving, as well as the number of the particular vehicle, and then call later? Either way, the bumper stickers seem designed to hinder highway safety, rather than promote it. And, even worse, isn’t it awfully presumptuous for the business owner to think that I’ll waste my precious time giving them feedback on their employees? Who in the world would care so little about the value of their free time that they would spend it calling a number to tell some flunky about about somebody else’s driving? If a company wants to be a good member of the community, let them treat their customers fairly, pay their employees a reasonable wage, and support civic institutions. They shouldn’t try to skate by with some meaningless bumper sticker. I’ve never put a bumper sticker of any kind on my car. I think they make your car look trashy as they inevitably fade and peel — and my car looks trashy enough without that extra assistance. I also don’t understand the point of political and quasi-political bumper stickers. Are they supposed to just make people who are like-minded feel better, because the bumper stickers show that others share their views and aren’t afraid to advertise that fact publicly? Or, are they supposed to help wavering people make their final decision through the weight of views expressed on the bumpers that happen to be on that section of road at that time? If there really are people so feeble-minded that their votes are swaying by bumper stickers, do they pay attention to the drivers of the cars that sport the sticker? If a guy drives like a jackass and cuts me off so he can edge in to the turnoff at the last minute, and the last thing I see is his “Obama 2012” bumper sticker, I’m not exactly in the mood to adopt his political views as well-reasoned. 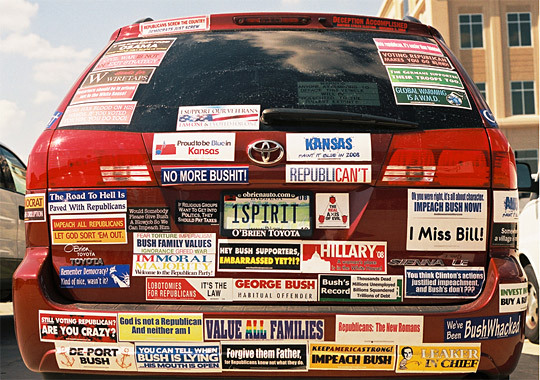 And what of the cars with multiple bumper stickers? Isn’t there a mixed message issue there? Which one am I supposed to read as it zooms by? Of all the bumper stickers I’ve seen recently, the one that I find the most puzzling is the “Coexist” sticker on which the letters are replaced by different symbols. Is the message that we should coexist? If so, don’t the religions all coexist already, as evidenced by the fact that their symbols are sufficiently well-known to make it onto an insipid, mass-produced bumper sticker? Or, is the message that we should coexist better — by, perhaps, not slaughtering or slandering people of different religious beliefs? If it is the latter, do we really think that a drive-by glance at someone’s rear bumper is going to convert a religious bigot into a thoughtful proponent of tolerance? By the way, do people with those “Coexist” bumper stickers on their cars ever get victimized by road rage incidents? If so, do they just shrug and point to their bumpers? And is there any way to study whether “Coexist” drivers are targeted for road rage because of the stickers? It seems like an awful lot is expected of that little blue sticker. I’d rather leave my car as is.